The site was a flat rock, bordered in the front by the lake but hidden by an ancient evergreen hanging over the water at a precarious 90° angle. Behind the rock a steep cliff framed the area. This would be the ideal place to build my gazebo. I would not build an ordinary gazebo purchased in a kit. No, this was a North Country gazebo. Paul, the local master craftsman, had gathered lumber from the woods for the floorboards and thin cedar trees as posts for the sloping roof. And, to bestow further authenticity, the wood was painted red and green, colors indigenous to the Adirondack mountains. After scurrying to numerous garage sales I located a slightly tilting wooden table and a chair woven out of birch twigs. This gazebo was the real thing! Inside I would write, meditate and read Thoreau or James Fenimore Cooper, authors synonymous with the setting. However, the most prized characteristic of this gazebo was that I could see but not be seen. Concealed by the evergreen, I watched Mike in his kayak paddle past under the branches less than five feet away but he never knew I was there. From time to time I called out a greeting but I could choose when to speak. On a morning when I wished anonymity I would watch the kayak glide by, but I was hidden. Solitude. Only the waters flowed and I, hidden in time, sat at the desk with pen in hand and observed–my only company a chipmunk that flitted in and out. Then the day approached when I moved across the lake. I lamented leaving my gazebo behind, until I came across a fragment of Brant Lake history that lifted my spirits. In 1894 the local general store, the one owned by Jud Barton, embarked on a voyage from the foot of Brant Lake to the Pebloe Hotel several miles up the lake. The intention was to convert the general store into the hotel kitchen. 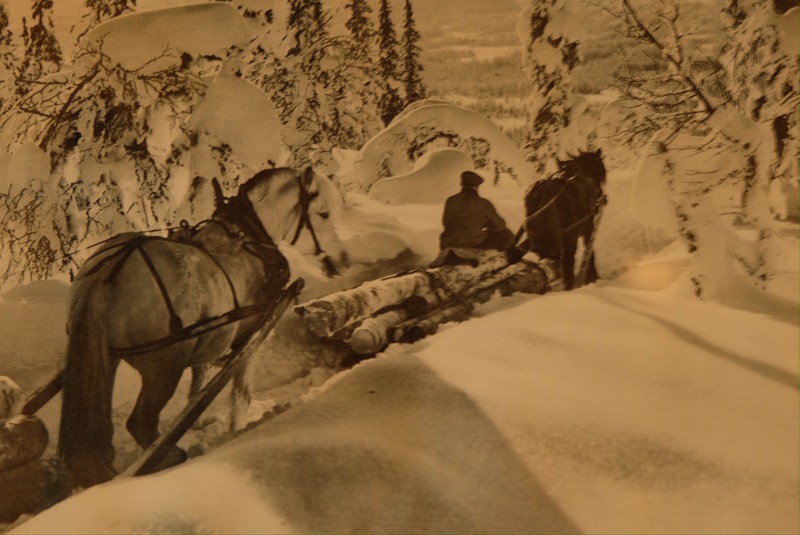 Transportation would be provided by a team of horses that, in the depths of winter, would pull the store along the ice until it arrived at its new home, a perfectly sound idea until, in the middle of the lake, Brant Lake’s first general store broke through the ice and disappeared! Yet, summoning my courage, I decided to attempt a similar journey with my gazebo. Unfortunately, no one wished to risk their horses and although we have a pony named Pokémon, one pony would never succeed. I suggested snowmobile power but the locals only laughed. My recourse was to dismantle the gazebo and move it piece by piece. This was a logical idea but when the initial supports were pulled from the side of the gazebo, the gazebo crumbled, as if to rebel against the audacity of moving it from its permanent home. Although I lack proof, I believe the gazebo shared my desire to hide from sight along the shoreline and protested being resettled in an open meadow on the other side of the lake. So, now I am seeking someone who will build me a less temperamental gazebo, one that can hold it together even under duress. On the other hand, I realize that in a world where privacy is elusive, the ability to see and not be seen is a special gift. Maybe I won’t build another gazebo although it would be fascinating to see a gazebo skating across the lake! January 3, 2016 in Brant Lake. I enjoyed the story of the General Store…but, it left me longing for more because, as we all know , there are many stories to be told about it…I love to hear about Brant Lake people and how they decided to live there…do you remember when the men from Brant Lake came to the town hall for the Friends of the Library and told their Brant Lake stories…it was a wonderful evening ..I’ll never forget Bruce and the guys telling about the bear that was killed and after it had “hung” to long was given to the teacher from NYC who put it in his van to take to the city…we are all so blessed to be friends and neighbors and to live in our community . I am looking forward to Chapter 2 of the general store.